Did the original squeeze bulb get a little overworked? Note that one of these is already included with all "Inflation" options on our products. If you are here for a replacement, also note that this bulb may not be the same size as the one that came with your original purchase, as we once included a larger bulb with inflatables. 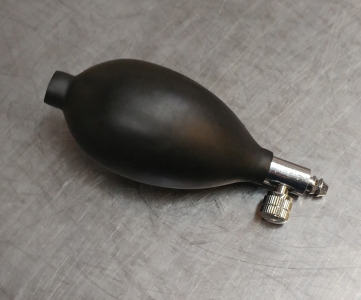 The Knot Gag can take at most 2 pumps of this bulb, the Fluffer and Puffer Fish can take at most 4 pumps, the Growler can take 6, and the Big Bad Wolf can take 8. If you have an older bulb, this is twice the number of pumps listed on the instruction sheet you should have received with the product.